Today was our last day at "Rock Hall," so it was our final chance to get every last bit of science at this location. We had a 2.5 hour science block filled with Mastcam change detection imaging of the Rock Hall drill fines and alternating ChemCam RMI and LIBS observations of the Rock Hall dump pile, drill tailings, and target "St.Cyrus 2." The ChemCam activities were followed by Mastcam documentation images of each of the aforementioned targets, and we also included a B-side computer diagnostic and an overnight APXS of the Rock Hall drill tailings. Gale Crater has become a lot dustier in recent sols due to a regional dust storm in the southern hemisphere that was spotted by the Mars Climate Sounder team, so we added several extra environmental observations to see how this is affecting the atmosphere. These included extra measurements of the amount of dust above us (with the observation known as the "Mastcam tau") and of visibility across the crater (with the "Navcam Line of Sight" and "Mastcam Crater Rim Extinction" observations). We also added more REMS 1-hr measurements to better capture the diurnal cycles of pressure and temperature. When the regional or global dust loading increases, it changes how the atmosphere expands and contracts in response to solar insolation, which affects how air moves around and alters the large-scale patterns of surface pressure (since pressure is caused by the mass of air in a column over the surface). We monitor this by seeing how the shape of the daily pressure cycle changes from sol to sol. More atmospheric dust also means more of the incoming solar radiation is absorbed before it reaches the rover, so daytime near-surface and ground temperatures decrease compared to normal. At night, however, the warmer overlying atmosphere emits more thermal radiation, keeping the temperature of the surface and near-surface warmer than usual. More dust heating also means that near-surface and surface temperatures are more strongly coupled, resulting in a reduced surface-to-air temperature contrast, all of which REMS measurements are starting to show. Another effect of increased dustiness is therefore that we expect to observe fewer convective vortices and dust devils (dusty vortices), because a smaller surface-to-air temperature difference means less heat is pumped into the atmosphere to drive convection. So tosol we also included three types of Navcam dust devil searches, to see if the dust activity produces a decrease in the number or size of dust devils. We'd normally expect to see a lot of dust devils in the current season (local summer). 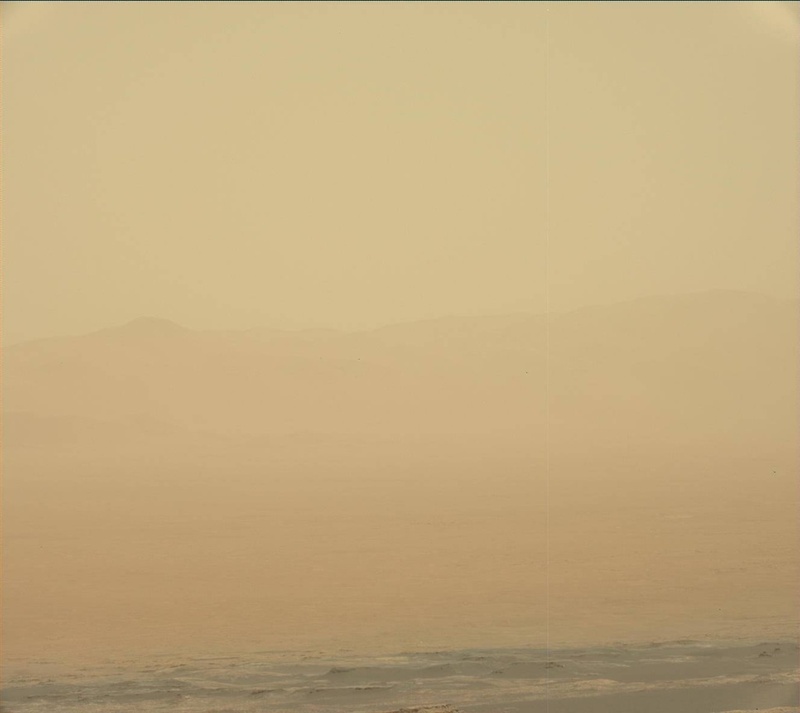 In fact, one passed right over the rover just as we were taking a movie a few sols before the dust began to increase! The second of the two frames above shows a slight reduction in visibility as this happened; at the same time, the dust devil's low-pressure core produced the largest vortex pressure drop ever measured on Mars (over 7 Pa, which is about 1% of the total surface pressure). Although we can't 'see' the dust devil in the images, we can tell the rover was inside one because of the decrease in visibility combined with the dramatic decrease in pressure.